Nab Cottage was first built in 1565 and extended in 1702. Some original parts are still here; beams, spice cupboards, creaking floors, mullioned windows, writing desk, De Quincey’s opium room, flagged kitchen and farm outbuildings – it was a working farm until 1940. 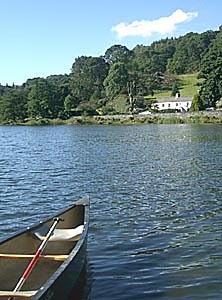 The atmosphere is easy going and most of our guests enjoy spending time inside; chatting by the blazing fire, reading at the window seats which overlook the lake, playing the piano, poring over maps and enjoying our homemade bread and a long breakfast ..
Views in all directions are stunning and from the door there are some excellent low level walks as well as plenty of challenging fell walks. 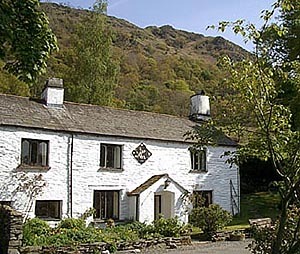 We are very near to the famous houses of William Wordsworth – Dove Cottage and Rydal Mount. 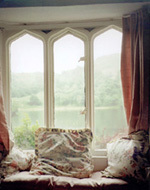 Our 7 bedrooms have beautiful views and are all individually furnished. Our lounge has a welcoming log fire and a smaller room with television is also available. We are licensed and can serve a light supper or a full dinner, with selection of pleasant wines at reasonable prices. The Badger Bar in the nearby hotel (500m walk) serves excellent food and beers. Bed and Breakfast per person per night £36 standard, £41 en-suite.